A Method to Test the Efficacy of Handwashing for the Removal of Emerging Infectious Pathogens Marlene K. Wolfe1, Daniele S. Lantagne1 1Department of Civil and Environmental Engineering, Tufts University Handwashing is widely recommended to prevent infectious disease transmission. However, there is little evidence on which handwashing methods are most efficacious at removing infectious disease pathogens. We developed a method to assess the efficacy of handwashing methods at removing microorganisms. Fabrication of Three-dimensional Paper-based Microfluidic Devices for Immunoassays Syrena C. Fernandes1, Daniel J. Wilson1, Charles R. Mace1 1Department of Chemistry, Tufts University We detail a method to fabricate three-dimensional paper-based microfluidic devices for use in the development of immunoassays. Our approach to device assembly is a type of multilayer, additive manufacturing. We demonstrate a sandwich immunoassay to provide representative results for these types of paper-based devices. Optical Control of a Neuronal Protein Using a Genetically Encoded Unnatural Amino Acid in Neurons Ji-Yong Kang1, Daichi Kawaguchi2, Lei Wang3 1Department of Neuroscience, School of Medicine, Tufts University, 2Molecular Neurobiology Laboratory, The Salk Institute for Biological Studies, 3Department of Pharmaceutical Chemistry and the Cardiovascular Research Institute, University of California, San Francisco Here, a procedure to selectively activate a neuronal protein with a short pulse of light by genetically encoding a photo-reactive unnatural amino acid into a target neuronal protein expressed in neurons in culture or in vivo is presented. A Hormone-responsive 3D Culture Model of the Human Mammary Gland Epithelium Lucia Speroni1, Michael F. Sweeney1, Carlos Sonnenschein1, Ana M. Soto1 1Department of Integrative Physiology and Pathobiology, Tufts University School of Medicine We describe a 3D culture model of the human breast epithelium that is suitable to study hormone action. Engineered 3D Silk-collagen-based Model of Polarized Neural Tissue Karolina Chwalek1, Disha Sood1, William L. Cantley1, James D. White1, Min Tang-Schomer2, David L. Kaplan1 1Department of Biomedical Engineering, Tufts University, 2 Insight into the complex actions of the brain requires advanced research tools. Here we demonstrate a novel silk-collagen-based 3D engineered model of neural tissue resembling brain-like architecture. The model can be used to study neuronal network assembly, axonal guidance, cell-cell interactions and electrical activity. Mosaic Zebrafish Transgenesis for Functional Genomic Analysis of Candidate Cooperative Genes in Tumor Pathogenesis Choong Yong Ung1, Feng Guo2, Xiaoling Zhang3, Zhihui Zhu3, Shizhen Zhu1,3 1Department of Molecular Pharmacology & Experimental Therapeutics, Mayo Clinic College of Medicine, Center for Individualized Medicine, 2Tufts University School of Medicine, 3Department of Biochemistry and Molecular Biology, Mayo Clinic The goal of this study is to demonstrate how the mosaic transgenesis strategy can be used in zebrafish to rapidly and efficiently assess the relative contributions of multiple oncogenes in tumor initiation and progression in vivo. Multiplexed Fluorescent Microarray for Human Salivary Protein Analysis Using Polymer Microspheres and Fiber-optic Bundles Shuai Nie1, Elena Benito-Peña1,2, Huaibin Zhang1, Yue Wu3, David R. Walt1 1Department of Chemistry, Tufts University, 2Department of Analytical Chemistry, Complutense University (Spain), 3Department of Electrical and Computer Engineering, Tufts University We describe a procedure for profiling salivary proteins using multiplexed microsphere-based antibody arrays. Monoclonal antibodies were covalently linked to fluorescent dye-encoded 4.5 μm polymer microspheres using carbodiimide chemistry. The modified microspheres were deposited in fiber-optic microwells to measure protein levels in saliva using fluorescence sandwich immunoassays. Using Chronic Social Stress to Model Postpartum Depression in Lactating Rodents Lindsay M. Carini1, Christopher A. Murgatroyd2, Benjamin C. Nephew1 1Biomedical Sciences, Tufts University Cummings School of Veterinary Medicine, 2School of Healthcare Sciences, Manchester Metropolitan University This article describes the use of chronic resident intruder social stress as an ethologically relevant paradigm to model postpartum depression and anxiety in lactating rodents. Imaging Analysis of Neuron to Glia Interaction in Microfluidic Culture Platform (MCP)-based Neuronal Axon and Glia Co-culture System Haruki Higashimori1, Yongjie Yang1,2 1Department of Neuroscience, Tufts University, 2Neuroscience Program, Tufts Sackler School of Graduate Biomedical Sciences This study describes the procedures of setting up a novel neuronal axon and (astro)glia co-culture platform. In this co-culture system, manipulation of direct interaction between a single axon (and single glial cell) becomes feasible, allowing mechanistic analysis of the mutual neuron to glial signaling. Evaluation of Biomaterials for Bladder Augmentation using Cystometric Analyses in Various Rodent Models Duong D. Tu*1, Abhishek Seth*1, Eun Seok Gil2, David L. Kaplan2, Joshua R. Mauney1, Carlos R. Estrada Jr.1 1Children's Hospital Boston, Harvard Medical School, 2Tufts University Surgical stages of bladder augmentation are described using 3-D scaffolds in murine and rat models. 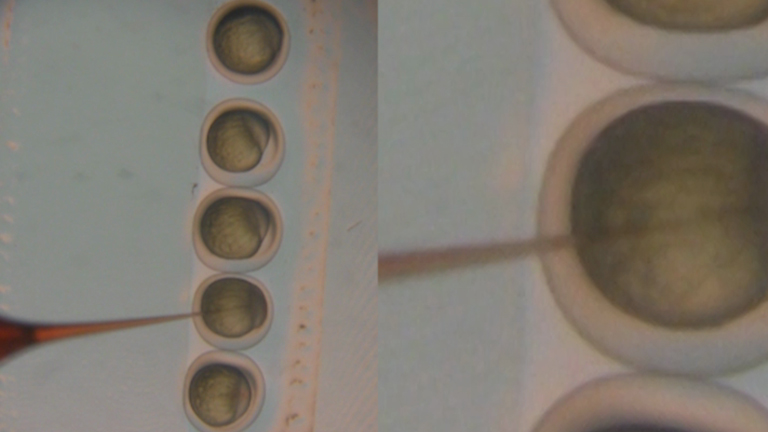 To test the efficacy of biomaterial configurations for use in bladder augmentation, techniques for both awake and anesthetized cystometry are presented. A Faster, High Resolution, mtPA-GFP-based Mitochondrial Fusion Assay Acquiring Kinetic Data of Multiple Cells in Parallel Using Confocal Microscopy Alenka Lovy1, Anthony J.A. Molina2, Fernanda M. Cerqueira3, Kyle Trudeau3, Orian S. Shirihai3 1Department of Neuroscience, Center for Neuroscience Research, Tufts School of Medicine, 2Department of Internal Medicine, Geriatrics & Gerontology, Wake Forest Baptist Medical Center, 3Department of Medicine, Boston University Medical Center Mitochondrial fusion was measured by tracking the equilibration of photoconverted matrix-targeted GFP across the mitochondrial network over time. Thus far, only one cell could be subjected to an hour long kinetic analysis at a time. We present a method that simultaneously measures multiple cells, thereby speeding up the data collection process. Isolation of Mammary Epithelial Cells from Three-dimensional Mixed-cell Spheroid Co-culture Kun Xu1, Rachel J. Buchsbaum1 1Molecular Oncology Research Institute, Department of Medicine, Tufts Medical Center A simple method is described for analyzing effects of tissue fibroblasts on associated epithelial cells. The combination of this method and three-dimensional tissue culture can facilitate analysis of cells after isolation from 3D. The technique is applicable to cells of varying malignant potential, allowing systematic study of effects of tumor-associated stroma on tumor cells. Silk Film Culture System for in vitro Analysis and Biomaterial Design Brian D. Lawrence1, Zhi Pan1, Michael D. Weber1, David L. Kaplan2, Mark I. Rosenblatt1 1Margaret M. Dyson Vision Research Institute, Weill Cornell Medical College, 2Department of Biomedical Engineering, Tufts University Silk films are a novel class of biomaterials readily customizable for an array of biomedical applications. The presented silk film culture system is highly adaptable to a variety of in vitro analyses. This system represents a biomaterial design platform offering in vitro optimization before direct translation to in vivo models. A 3D System for Culturing Human Articular Chondrocytes in Synovial Fluid Joshua A. Brand1, Timothy E. McAlindon2, Li Zeng1 1Department of Anatomy and Cellular Biology, Tufts University School of Medicine, 2Department of Rheumatology, Tufts Medical Center A 3D system of culturing human articular chondrocytes in high levels of synovial fluid is described. Synovial fluid reflects the most natural microenvironment for articular cartilage, and can be easily obtained and stored. This system thus can be used for studying cartilage regeneration and for screening therapeutics for treating arthritis. Amplifying and Quantifying HIV-1 RNA in HIV Infected Individuals with Viral Loads Below the Limit of Detection by Standard Clinical Assays Helene Mens1, Mary Kearney1, Ann Wiegand1, Jonathan Spindler1, Frank Maldarelli1, John W. Mellors2, John M. Coffin3 1The virology Core at the HIV Drug Resistance Program, NCI-Frederick, 2Division of Infectious Diseases, University of Pittsburgh, 3Department of Molecular Biology and Microbiology, Tuffts University Quantifying levels of HIV-1 RNA in plasma and sequencing single HIV-1 genomes from individuals with viral loads below the limit of detection (50-75 copies/ml) is difficult. Here we describe how to extract and quantify plasma viral RNA using a real time PCR assay that reliably measures HIV-1 RNA down to 0.3 copies/ml and how to amplify viral genomes by single genome sequencing, from samples with very low viral loads. Encapsulation of Cardiomyocytes in a Fibrin Hydrogel for Cardiac Tissue Engineering Kathy Yuan Ye1, Kelly Elizabeth Sullivan1, Lauren Deems Black1 1Department of Biomedical Engineering, Tufts University We describe the isolation of neonatal cardiomyocytes and the preparation of the cells for encapsulation in fibrin hydrogel constructs for tissue engineering. We describe methods for analyzing the tissue engineered myocardium after the culture period including active force generated upon electrical stimulation and cell viability and immunohistological staining. Primary Dissociated Midbrain Dopamine Cell Cultures from Rodent Neonates Lauren E. Frank1, Angela D. Caldera-Siu1, Emmanuel N. Pothos1 1Department of Pharmacology and Experimental Therapeutics, Tufts University Primary dissociated midbrain dopamine cell cultures allow for the study of presynaptic characteristics of dopamine neurons. They can be used to monitor real-time dopamine release kinetics and protein/mRNA levels of regulators of dopamine exocytosis. Here, we show you how to generate these cultures from rodent neonates. Survivable Stereotaxic Surgery in Rodents Brenda M. Geiger1, Lauren E. Frank1, Angela D. Caldera-Siu1, Emmanuel N. Pothos1 1Department of Pharmacology and Experimental Therapeutics, Tufts University The monitoring of extracellular neurotransmitter levels in distinct brain regions of freely moving animals offers insights on the link between neurotransmitter release and behavior. In vivo microdialysis coupled with electrochemical detection provides excellent anatomical and chemical resolution; and information on how basal neurotransmission is altered by pharmacological or physiological manipulations. Production of Replication-Defective Retrovirus by Transient Transfection of 293T cells L Cristina Gavrilescu1, Richard A Van Etten1 1Molecular Oncology Research Institute, Tufts University This technique demonstrates an efficient way to prepare replication-defective retroviral stocks encoding a human oncogene, and subsequently used for induction of myeloproliferative disease in the mouse model.